Ash and I are what you might call flexible. Not because we were born this way, but because He is making us this way. It has not been easy, but after 2 years of it we are starting to get pretty good at it. There is a winter storm headed into Omaha tonight. Bringing with it snow and ice. Not good for a road trip. Especially for a Texan who has never driven on it before. So what now? Leaving around midnight isn't going to work. We need to outrun the storm. So...Ash and I are ready. We are loaded and ready to go. Dave has changed his flight from Omaha to Kansas City and I just have to find him. I've never been to Kansas City and I have no idea where the airport is, but Ash and I are going to give it a try so that we won't have to drive in snow and ice tonight. We plan on leaving Omaha around 4p.m. and arriving at the airport sometime between 7and 8pm. Dave will land at 8:40 and the three of us will travel through the night until we arrive home tomorrow. Ashley's stool output continues to climb. Our goal pre-rejection was no more than 400cc in 24 hours. Post rejection our goal has been around 600cc in 24 hours working itself back to that 400cc mark giving her around 30-40cc/per kilo of output a day. 48 hours ago her output climbed to 1070cc. Yesterday she has 1250cc. Today she has already been stooling at a rate of 300 every 4 hours. Why is this happening? Two guesses. Viral infection or Rejection. With all of our immunosuppression changes over the last week and half she has gone from too much coverage to almost none and we are still adjusting the levels trying to find a good balance. What are my options? We can sit in our hotel room and replace fluids or we can sit at home for the next few days and replace fluids. We have decided to make the trip knowing that with ANY changes in her respiratory status we will jump on a flight and return. Please, please pray that she will remain stable. She looks great! She is happy and playful. Her labs look better than they have in weeks. Her numbers are handling the loss of fluid and its replacement very, very well. Also would you please pray that she might not be back in rejection. As always it is something that hangs out in the back of all of our minds. Especially with high stool output. I have talked to our transplant team several times today and they want to do nothing but watch her for the next few days, so we will overnight her lab work each day and watch. Edit #2: It looks like we will not be traveling until this evening. Dave is going to fly in and will land around 11pm. I will pick him up from the airport and we will leave from there. This will give me some time to order more replacement fluid for Ash. We are just now finishing her replacements from last night and it is 5a.m. Time for a little nap before labs. Hopefully her stool slows down today or we may not be traveling at all. My nerves have my stomach upset and I don't want to have to call Blake and Al to tell them our trip is cancelled. Please pray that her output decreases today. Other than a whole lot of stool, she looks amazing! She is now ready to begin her day just as mommy is ready for some rest. Silly Pickle! Edited: Some have asked how long our pass is. I will get to spend Sat, Sun, Mon., and Tues, at home(as long as Ash's condition is stable) and then I will leave early Wed. morning to make the drive back to Omaha. All in all I am allowed to leave tomorrow(Friday) and stay through Wednesday(but Friday and Wednesday don't really count because I will be driving the entire time.) They will not allow us to stay home because Ash's bowel has not been restored to the point that it was before her rejection. Who knows if it will ever get back to that level of functionality, but until it does we will reside in Omaha, Ne close to her transplant team. I hope this helps answer any questions I may have left dangling in the post. They did it. They agreed and granted a short pass to go home. The doctor made sure I understood we were no to stay, but that she wanted us back in clinic next week. They have also scheduled another biopsy for Ash next Friday. I don't really know how to describe the feelings that I am having. I guess it really doesn't matter if everyone understands how exciting yet frightening, how freeing yet restricted, how grateful yet still disappointed, we feel. The range of emotions that come over you when you realize that you are still clawing for each and every day of life for one of your children is very vast. When you hold your breath before each appointment hoping to hear good news and the words, "You can move back home" and then they don't come. It has been the most painful, most difficult, most trying, most amazing, most humbling, most incredible, most blessed two years of our lives. This is so hard to put into words. I am thrilled to have been granted permission (although they did not want to give it), but still hurt realizing that we have to return and it is indefinite as to how long. As soon as I walked back into our room my phone rang. It was Blake. "Did you have your meeting? Are you coming home?" "For a couple of days but then we have to bring Ash back." "That's ok, mom. We'll take a couple of days. I can't wait!" Allie came in from tumbling while we were on the phone. The first thing she said was, "YOUR COMING HOME? YOUR COMING HOME IN TIME FOR CHRISTMAS!" She was so excited. I had to explain to her that it was only for a few days and then I would have to bring Ash back. I told her I didn't want to push for Christmas just yet. "Thats good, mommy. You and Ashley come home and then when you get back you can start pushing them for Christmas." This made me laugh out loud. She talked all about decorating and all we had to do. Her tree, Blake's tree, the family tree, the mantle, the lights outside on the house, the wreaths on the windows, and "the yard". "The yard?" I asked because we don't put anything out in the yard. "YES. We NEED deer or something in the yard." I guess we will be shopping for some yard decorations. The excitement in their voices blessed my heart. They can't wait for Ash and I to be home. They won't be able to concentrate at all tomorrow. I hope their teaches will understand. Its been 10 LONG weeks since we have been in our home and I can't wait to pull into the drive. Ash looks great today, but her stooling is a huge problem. She is putting out more than she ever has and it is a race trying to keep up with it all and get it put it back in. We made another change to her immunosuppressant today. We stopped the Rapimune and put her on something called Cellcept. It looks to me like it has fewer side effects, but like any of them it puts her at great risk of picking up an illness or infection. We are using it together with her normal FK and hoping to keep both doses low enough to protect her kidneys, but high enough to provide protection for her organs. Its all such a guessing game. Here we are, Ash and I spending another silent night in Omaha, Nebraska. It's hard to believe we have another holiday season approaching and the two of us are away from home again. At least we have her tree here with us. It's more than Blake and Al have at home. The house sits empty of any signs of the season. This makes my heart so, so sad. If only I could have a day or two at home. Just long enough to make some magic happen for them then my heart would feel better. I know its not near as important to Dave or Blake or Al, but its important to me because its just something I have always done for them. Its just not the same without having that opportunity. Blake and Allie and I have such fun going through the decorations together. I love listening to Blake and Allie remembering each and every story that goes along with each and every ornament they hang on their trees. I love watching the excitement in their eyes as they re-discover those sentimental treasures that only make an appearance once a year. I love the smell of Yankee Candles burning on the mantel and the sound of Christmas carols playing throughout the house. I love sitting across from the tree late in the evening when all of the lights have been turned down and just enjoying the peaceful feeling the glow of the tree gives to my heart. Ashley and I sit and rock across from her tree here in our hotel room. Everything on her tree is beautiful. It is all silver,white, and pink(except for our pickle ornaments that hang on the branches reminding us of people all across the country who have prayed for our baby gherkin. They do hang from pink ribbons.) Each ornament on her tree represents a day, an event, a person, or a memory from her life. The first ornament Dave and I bought for her hangs on the tree. There are ornaments that were chosen for her by her grandmothers. There are ornaments that remind us of our tiny friends who have gone on to Heaven. There are ornaments that hold photographs of Blake, Allie, and Ashley. There is a silver angel ornament created by James Avery(my favorite jeweler) that reminds us of the life of her organ donor. There is a beautiful church ornament that represents our faith. There is a princess carriage ornament that holds a photograph of our tiny princess. There is the sweetest gingerbread house that makes me smile each time I see it because my Ashley Kate is just as sweet. We have an angel ornament given to Ash by her sweet friend Caroline that hangs on her tree. There are the tiniest pink and purple candy canes hanging from the branches. Glittery snowflakes that sparkle when the lights twinkle. Pink gauzy ribbons attached to the branches that have no ornaments hanging from them. When I look at the tree I remember her first Christmas and the events that surrounded the day while she was in the NICU in Dallas. When I look at the tree I remember her second Christmas that was spent in the PICU here in Omaha and the difficult day that immediately followed. When I look at the tree as we approach her third Christmas I wonder where we will spend it. I wonder if God will grant another miracle and take us home for Christmas. When I look at the tree I remember the many miracles that God has already performed in Ashely Kate's life and I humbly pray for another. I'm nervous about tomorrow. I desperately wish for Ash to be allowed to go home. I so badly want to here them say she is in an ok place and safe enough to return to our home. I am afraid if they don't then I won't be able to hold back the tears. No matter what happens I know that it will eventually be alright. Even if I am disappointed I know that God will have something special in mind for our family. Its coming back! After two long months it has finally started to show itself again. I am so excited! Ashley Kate had a wonderful day. She laughed. She clapped. She played. She smiled and her eyes twinkled. You could see the silliness and the orneriness in her eyes. Her personality is returning and it blesses my heart so much. I just love her so, so much. It has been such a long time since I have seen her feeling good. Good enough to love life again. What a blessing today was. She made me laugh out loud as we played and rocked and cuddled. We read Goodnight Moon over and over again. Each time she listened intently. I'm not sure why she loves this book so much, but it is definitely her all time favorite. She grunts and reaches for it each and every time we sit down to read. She talked to Blake and Allie on the phone tonight. She smiled ear to ear as she listened intently to what they had to say. She loves to push the buttons on the phone as she talks and she accidentally put Blake on the speaker phone. The words I heard brought a smile to my heart. "Good night room. Good night cow jumping over the moon. Good night light and the red balloon. Good night clocks and good night socks. Good night Ash, bubba loves you." Oh, I love these children! Things look good for Ash this week except for her high stool output. We desperately need it to slow down. As long as she stools out to this extent she will have to keep her central line for replacement IV fluids. As long as she has the central line the team is hesitant to allow her to go home. We have a clinic appointment Thursday at 2:20. I am hoping to get permission to go home for a few days. Unfortunately Ashley is stooling more than ever. I think it is a side effect of her new immunosuppresant. I will be running replacement fluids until around 4am this morning. She did not require any for the first 12 hour period today and I was feeling encouraged that perhaps today would be the day her body would adjust. Not so. Tonight she is requiring 150ccs of fluid. I guess I am hoping that the twinkle in her eye remains. I want them to see how good she is feeling and for them to feel confident in allowing us to leave for a while. Blake and his friends are praying for us to come this weekend. He told me they are praying for it everyday and I can hear the importance of this in his voice. He wants Ash home. He continues to tell me that it doesn't matter to him if she never talks or walks or does all the normal stuff. He just wants me to bring her home so she can grow up. He really, really loves this baby and is really, really missing her. I am praying that we can get home for at least a few days for Blake and Allie's sake. They need this visit to happen. I think we all needed this puppy. From the sounds of it she has melted the hearts of all who have met her. I'm not sure if it is the dog or the reaction of our daughter, but either way its been good for us all. Even when we don't admit it our hearts are hurting. Some days we all just keep going and try not to dwell on the hurt or the disappointment we feel. From Dave and I, to Blake and Al, to the heart of our parents, at some level we all hurt over our sweet Ashley Kate's struggles. Tonight a little of the hurt melted if only for brief moments as Allison discovered her puppy hiding in her bathroom as she came in. "What?" Dave heard her say. "This isn't Nan's puppy. This one is white!" Out she came smiling ear to ear holding tightly to this little bundle of Hope. I wish I had been there. When I called tonight she answered the phone and said, "Hello". "Hi, baby! What'cha doing?" I asked her. "I LOVE HER! I REALLY DO." I could hear the smile on her face coming through her voice. I just got off the phone with her again. She still can't believe this puppy is hers. She is in love and the pain in her heart has melted away tonight. She announced to her daddy that, "this was the best thing you and mommy ever did for me. Except giving me life of course!" She and her daddy are sitting on her bed playing dress up. Not with barbie dolls or polly pockets, but with Hope. "She needs jammies." Allie told him. We don't happen to have any. Yet. She settled on a pink cheerleading hoodie for Hope to sleep in. My heart is smiling just knowing how happy Allie is. What a blessing it is to be able to put smiles on our children's faces. Nothing quite compares. Whether it be Ashley Kate finding her new copy of Goodnight Moon yesterday(it was supposed to be a stocking stuffer), or taking Blake to meet Pudge(still one of the best days of his life! ), or giving a little bundle of Hope to my oldest daughter who desperately wanted something to love. I love being their mom. I so look forward to returning to our home with Ashley Kate. I just long to be near all three of the children. To tuck them into their beds each night. To listen to them talk. To see them hang out together. To hear all the details of their days. I hope that God allows us to go home for Christmas. I hope that we receive our pass this week. I hope we are all decorating our tree this Saturday as Ashley Kate plays on the living room floor. I guess Hope has kind of renewed a little of the hope I had let slip away. Ashley looks better than she has in over 2 months. I am so thankful to see her playing, not struggling to breathe, not grunting from her aches and pains. Her lab work looked pretty good today. She needed a little magnesium so we went to the treatment center for a bolus. Her BUN has returned to a normal level for the first time in months. Her kidneys are obviously reacting well to the medication change. Unfortunately the change has caused her stooling to increase. I have no idea how long it will take for her bowel to adjust after this whole rejection thing. At this point I am replacing large amounts of fluid through her central line and this could go on for months. No one wants us to go home with this line, but we need to live in our home, not this hotel. I am praying for good things to happen this week and for soft hearts that say, "Go home for a few days or even a week." What a blessing that would be. Well, I suppose I am ready to snuggle up next to this beautiful baby who is all tucked in with her pink, "footie" jammies and rosy cheeks. She just looks so sweet. Each time I kiss her little forehead my heart melts a little more as I love her more deeply than I did the time before. Allies is snuggled up next to her Hope and Blake is snuggled in with Nan's puppy. Dave is left with nothing to snuggle up with except a memory that will last a life time. That little puppy in her zebra striped dress has melted his heart as well, or maybe is was the smile on his little girls face. Either way he feels blessed and that blesses me. P.S. Hope is a Maltese and she is not expected to be more than 4 or 5 pounds when she is full grown. She will not shed and she is said to become a very loving, gentle house pet. Our research said she would attach to one person in the family and that was our hope for Allie. Perfect for our needs for Ashley Kate as well as Allison Brooke. We have spent an entire year researching and this was the breed that came the most recommended for Ash's special needs. We feel very, very blessed to have her. I "hope" she loves her. I "hope" she knows how much she is loved. I "hope" she doesn't feel quite so lonely anymore. I "hope" she snuggles up close to her tomorrow night and thinks of me. I "hope" to be home with her soon so I can love on her and her "hope" too. I "hope" her daddy remembers to get out the camera. Dave and I think that "Hope" is such an appropriate name for Allie's little one. The fact that Omaha has given our family "hope" not once but twice now is just kind of special. My heart just smiled as Dave said, "We found hope here last year when our call for transplant came, and now we have found "Hope" this year for Allison Brooke. Omaha, Nebraska is just full of hope!" I have a feeling this little one will always bring a smile to my face as I think of where we found her. Oh, how I wish I could be with Al tomorrow and see the look on her face as her daddy brings "Hope" in. I can just imagine that little girl loving on this little one. She has held onto the "hope" inside of her heart for over a year now, and tomorrow her "Hope" will become a reality. God continues to be so very good to our family! Shhh, cause Al doesn't know yet. Nobody tell her. I just thought I would share our little bundle of "Hope" with you. By the way, Dave is refusing to travel with her dressed up like this. He already knows how much the other passengers are going to be hating him for the whining and yelping and he doesn't want to add any fuel to the fire. I think she looks great in her outfit, but I am having a hard time convincing him. thankful for. If we had been blessed with nothing else, she would have been enough. She is so precious and her daddy,her mommy, her brother, and her sister are thankful for her. We are blessed that she is here. Our holiday was sweet. It started out to be a tough, tough day. Emotional. It didn't take long for us to get a handle on the importance of where we are. Dave shared some beautiful thoughts from his heart and we concentrated on the good of our day and all of the blessings. We slept late, played scrabble, worked on our Christmas puzzle, visited with friends, enjoyed a yummy dinner prepared by some of our favorite people(we LOVED the dessert, Daisy. Thank you so much! ), rocked our sweet baby, and chatted with Blake and Allison over the phone. Our day was blessed and we went to bed with full tummies and full hearts. God is good. We spent the last couple of days just hanging out together. We have taken long drives and done some Christmas shopping. Our Christmas shopping experience has been a little different than most. The three of us load up in the car together. One of us goes into the store(usually me) and the other stays in the car playing with Ashley Kate. Our plans for the children's Christmas surprise have had to change. It was too large to pull off with me here and Dave there, so choosing alternatives for them has been fun. One thing I am getting pretty good at is accepting when our plans have to change. Our children are amazing and they truly deserve the surprise we had in store. When I asked them for Christmas lists they were so, so sweet. Blake only gave me a couple of ideas. Nothing spectacular just some things he said he would like but didn't really need. I have asked him repeatedly to try and come up with some other items and he says there is nothing else he needs. Allison Brooke's list began with the number one item she has been waiting on for over a year. A puppy. I don't know if you remember the series of journal entries last year that involved her NEED to love on something while Ash and I were away. She would have settled for a hamster. The one that loved her at the pet store? Remember? Then we researched and found a breed of dog that would be acceptable for Ashley Kate as well. Allie has shopped and shopped with her grandmas for this "imaginary" puppy that never showed up. Anyway, her first item was of course "Hope"( she named the imaginary dog Hope because she hoped she would get one), and her second item "could knock the first one of the list if she could have it." That statement got me curious. Item number two? Her mommy and Ashley to come home for Christmas. That one got me crying. I can't promise the second item, but her daddy has made sure the first will happen. Lucky him, he will be flying home bright and early Monday morning with the surprise of Allie's life time. Shhhh, don't tell anyone. Al doesn't know. If you would like to pray for Dave on Monday morning from around 4am till 11 am I am sure he would appreciate. He is sure to be the most hated passenger on the flight toting this fluffy ball of yapping "Hope". She sure is lucky to have this man for her dad. Ashley Kate has had some good moments and some bad the past few days. She is breathing on her on while she is awake. She does require oxygen support while she sleeps. As long as she is doing this they will not agree to allowing her to go home even for a visit. We are hoping for this to resolve by Thursdays clinic appointment when I would like to ask for that pass to go home again. Dave and I would love to decorate the tree and the house for the kids if Ash is able to travel home for a few days. I would of course be returning, but even a few days at home would be a gift. her labs numbers a struggling. We are having to adjust her new immunosuppresant in an attempt to get it at the right level. This could take a while I am told. her liver enzymes are also a mess. No one know what is causing one of them to climb, but we are wondering if it has anything to do with her new med. It seems to have begun about the same time. Lots of changes and juggling going on inside of her right now. To be honest, all of the changes are done by phone. I don't even see anyone so I am hoping we will be granted our pass again and be allowed to make the changes at home for a few days next weekend. This is my short term Christmas wish. How thankful I am tonight that the words of this song are so true in my life. Even when I can't seem to figure it out, He is right there already seeing and knowing. Tomorrow is Thanksgiving and I had no idea we would be spending it in Omaha, but He did. In my life He is not only using a still small voice, but also our smallest child to work His wonders. Many days I have longed to hear the "thunder" or see the "lightning" to help me figure out what we should do, but instead He has quietly led in one way or another to get us to the place we are tonight. I have learned that it can still be His voice I am hearing even when all around me things have become quiet. I wanted to be on the road tonight, traveling toward our family in order to surprise them all when we walked through the door. It was not what He had planned. I am still listening and learning as I continue on our "journey" with Ashley Kate, and I am desperately trying to follow the "One who is the way". His plan is the only road we need to take even though I may want to go down my own. Ashley and I were discharged from the PICU today. We are now in our room in the Lied and she is sleeping quietly with one quarter of a liter of oxygen flowing under her nose. She looks really good and she is really close to breathing on her own. Tonight I am thankful to be here with her. Every moment and every breath of her life is to be celebrated and I am thankful for each one. She is a miracle and our life is blessed. Whether we are together or apart, at home or away, Dave and I are grateful for our blessings and we know that God already knows what lies ahead for our family and He also remembers what was behind. It's all going to be ok. We just want His will for our lives and for the lives of our children. Only the Father knows how very much I love the snow, and only He could really see what a crummy place my heart has been in lately. So what does He do? I wake this morning to a BEAUTIFUL showering of large, fluffy, snowflakes outside our windows. What can make the PICU a lovely place? Being on the 5th floor and having the opportunity to watch the snow float all the way down to the ground. I am smiling. Sure, I can hear it know, "What makes you think the snow is for you?" Well, I just think that He cares that much about me and He knew what could make my heart smile. I'm sure it is serving other purposes as well, but for me it is bringing me happiness. Ashley Kate? she could care less and wishes I would have allowed her to sleep late rather than waking her up with my original, "Its Snowing" song. I can't wait for Dave to get here so we can watch it together. Snow just makes Christmas songs sound even better, don't you think? Well, I think its funny how things change. It was only a few months ago that I began counting the days until we could start decorating for the holidays. Ash and I were sitting on the floor at home and we were talking about Thanksgiving and Christmas and I was telling her how wonderful it was going to be to have her home this year. She sat and played and pretended to care about all I was sharing. I was just so grateful that day as I anticipated how wonderful the fall and winter holidays were going to be this year. My goal was to make it more magical than ever for the kids since it would be our first one with all five of us together. Today my goal is different. My goal is air. Oxygen for Ash. That is what I am now concentrating on. She has made huge progress this week. From 10 liters down to only one fourth of a liter. She just has little ways to go. They are wanting to move us up a floor, some of us are wanting to move out. As always Ash will be safer away from the larger population of patients who have those yucky viruses. A decision will be made later today. Many, many changes are being made. One of the biggest is a switch from her current immunosuppresion to a newer one that will be less toxic to her kidneys. It all seems like a trade off to me. The more I read about the new drug the more concerned I become. We are switching one set of trouble and issues for another. What do you do? Currently Ash's kidneys are struggling causing her to need more fluid which in turn causes her to become "overloaded"( only enhanced by another medication she is on) causing her to need oxygen support. The top priority for now is keep her immunosuppression at a safe level while we ease up on the stress it is placing on her kidneys. It is a difficult place to be in. The side effects of this new medication are ugly! but they really want to give those kidneys a break so we will for a while. Yesterday our surgeon told me, "She is in a tough spot. She has a history of PTLD( the lymphoma in her lungs) and of rejection. Thats is a fine line she is walking between the two." If you go down on her immunosuppression then her organs are at risk. If you go up on it then she is at risk for more tumors and lymphoma. It all makes me want to scream, and then I just become "ok" with it. I'm not really sure what to think anymore. I have talked on the phone with Trish 4 or 5 times today and each time Ash seems to be in a different position. Early in the day I was told that her kidneys were not working right and they needed to do an echocardiogram because sometimes these kids can have heart failure. What!?! This was not good news and hard to swallow. Then tonight I hear that the echo was fine and Ash is looking much better, she is off oxygen and holding her own and if she continues to do well she could be realeased from the hospital tomorrow. Crazy how fast the transplant kids can turn. I am very proud of her and I do believe she is the strongest little gherkin I have ever met. I will be hopping on a plane tomorrow and flying back to Omaha to spend Thanksgiving with the girls. Blake and Allie are at their cousins in Oklahoma and they are having a great time. I am really glad they are there and thank our family for having them. I can't wait to get back to Omaha tomorrow. The only problem I see is that I am from Texas and might possible freeze to death when I get there. I just have so much to be thankful for this year. Dave and I have been holding on to a secret. A big one. A secret so big that we couldn't wait to share, but we were forcing ourselves not to in order to pull of the surprise. My heart had been set on it, but it is not to be. Today's events stole our secret and spoiled our surprise. Disappointments come and go in this life. Some are bigger and harder to swallow than others, but in the end I usually learn something from them. I'm counting on this one to hold an important lesson for me. I just haven't had time to figure it out. When I look back over the larger disappointments in my life something good and beautiful eventually comes around. So although my heart hurts over the loss of a privilege that had been granted, I secretly wonder what lay in store just around the corner. It could be something wonderful. One of the results of our meeting on Friday was that we had been granted the opportunity to slip out of Omaha on a 3 day pass. A pass that had to be one of the biggest and best secrets I have ever held on to. A pass that was going to be the surprise of a lifetime for our family on Thanksgiving day when Dave, Ash and I rang the doorbell and joined our family for the first holiday in 3 years. Ashley's first family holiday ever. The joy and anticipation I have been holding in my heart for the last few days has kept me awake at night as we planned our surprise. I was so looking forward to the fellowship, the memory making, the photo opportunities, the late night games of sequence, the fun of Christmas shopping with my sisters, and the happiness on every one's hearts. It is not to be. We will not be secretly traveling all through the night in order to arrive at my sister's on Thanksgiving day, and there will be no surprise. As I sit and rock this precious little girl all snuggled up on my chest in her flannel night gown I still am thankful. My eyes sting with tears because I truly am disappointed, but my heart swells because she is here with us. She is the sweetest thing I have ever loved, and although the judge was correct when she warned us to prepare to have broken hearts as we left the courthouse that day we have never felt more blessed. How could she have known that loving Ashley would not only be the biggest heartache of our lives, but the biggest blessing as well. She had no idea how God had smiled on us that day. Ash is still struggling as we try and use diuretics to pull the fluid off her chest. She is sating in the low 90's with the help of oxygen and has managed to fight off the ventilator so far. Her blood gases are beautiful and at this point it looks as though she is only fighting fluid that has shifted out of her vessels and into her lungs and tissues. We have not identified any source of infection and she has not spiked a temperature. The fluid balance is one of the trickiest parts of transplant. Ashley's has never been that stable and it seems as though it will be the monster we fight over and over again. She is so sensitive and can easily slip into respiratory distress in just a matter of hours once she begins to shift. This how she woke up today and this is why we now sit in the PICU. I hope it is worked out quickly and I hope she will be allowed to begin feeds again tomorrow. Thanksgiving day will prove to be about the same as last year. Dave and I will sit in the PICU taking turns rocking our baby. The only difference will be that she will not be saying, "My mama" over and over again for our camera. Oh, how I miss her sweet, sweet voice. Welcome back to the PICU, Ashley! I really must have a banner printed that stays permanently fixed to the wall. I can't even type about my emotions at this point. I am afraid if I stopped to try and think for too long that they might over take me and this is definitely not the place to allow myself to be broken in. Just know that it has been a difficult day to swallow. Ashley's chest x-rays show that she is fluid over loaded. Her little body just can't seem to figure out where to put the fluid it needs in order to function. Upon our arrival in the treatment center her oxygen sats were a whopping 66! Unbelievable how quickly things can change in her little body. In 24 hours she went from stability to an inability to breathe on her own. She is now on 4 liters of oxygen as we try to pull fluid off of her. Why the PICU and not general Pediatrics? In case we can't get the fluid off and she needs more support that would come from the ventilator(the big ugly thing is sitting in the corner just staring at us!). Our disappointment runs deep. Deeper still since we really believed we were so close to leaving Omaha behind for the warmer Texas climate. Dave tried to convince the doctors that we couldn't breathe during the winter months and that we would all be much safer in Texas. Looks like we will need winter coats. Ashley Kate's feeds have been turned off. Can I even begin to describe how bad that feels? No, I can't so why bother. Hopefully in a day or two she will be restored to a more normal fluid level and we will begin to tackle that feeding monster again. Dave slipped out around 4 this morning to catch his flight back to Texas. He will be working 3 very full days in the office and then will catch another flight out of Shreveport to arrive back in Omaha around midnight Wednesday. I told him it wasn't necessary, but he thinks it is. He is going to be exhausted by the time he gets back. I already miss him. Once he left I laid there listening to Ashley Kate as she struggled through a very restless night. She isn't feeling well. Yesterday was a bad day for her. Dave had a really hard time seeing her not feel good. She is different than when we left home and it broke her daddy's heart to see find that she no longer wanted to be held or to play with him. Ash is more content to be left alone. She literally cringes each time she even thinks you are going to touch her. We talked a lot about the changes in her, and we look forward to being home and stringing lots and lots of good days together in hopes of having her return to who she was. Our visit was really nice and relaxed. We took long walks together, talked late into the night, played games, acted silly, and just enjoyed our days. Yesterday was difficult for me because I knew I would be facing today without Dave. We took Ash out to the zoo in an attempt to distract her from not feeling well, but she only wanted to sleep. The weather was so nice and cool and the long walk around the zoo was calming. There were no crowds and we basically had the place to ourselves. Ash did wake up long enough to enjoy parts of the aquarium. The shark tank is a tunnel that you walk into and the fish and turtles and sharks swim all around you and above you. I think she enjoyed that for a few minutes and then she went right back to sleep. Her FK level was too high yesterday along with her BUN causing her to be pretty miserable. We gave her a fluid bolus in the afternoon and ran replacement fluids last night so I am hoping things look better for her today. We plan on doing laundry and resting for most of today. She may need another albumin bolus this afternoon and that would cause us to have to get out and go to the treatment center, but other than that we are laying low and listening to our Classical Christmas. Dave and I put up Ashley Kate's tree the other night. It makes my heart happy and sad all at the same time. Happy to see her purple twinkling lights and pink ornaments that show how much she is loved by those who chose them, but sad realizing it is the 3rd holiday season she has been away from home. Ash has never experienced Christmas in our home and that breaks my heart. I pray that someday she will only have memories of family Christmas' surrounded by loved ones, and that the memories of these early one will only be stories shared with her. How I long for her to be made whole enough to live at home for every holiday that come along. The details of our meeting basically came down to us sharing our hearts with the surgeon. Reminding them that we were parents who needed to raise our family together in our home. Assuring them that we are willing to travel back and forth even weekly if it meant that our children could be raised together. Letting them know that we are willing to sacrifice our time, our finances, our resources, our anything to bring our family back together. We asked for them to share the time line, the goals, the plan that they had in mind for Ash with us. We sat and visited for a couple of hours trying to get all of our questions answered. We made great progress in the "relationship" that I feel is missing between our team and our family. We are more than just a chart or a number in this hospital. We are people, parents, a family and I am afraid that sometimes the reality of long term hospitalization is that those things are accidentally overlooked. They shared with us that they have a very hard time "sharing" this population of patients with other doctors or hospitals because of the frailty of them and the importance of timing. It all makes sense even though it makes life difficult. The fact that if Ashley needs a biopsy or scope or CT that it can be done in a matter of minutes versus being scheduled a week later when their was an available slot can make all the difference. We agree. This hospital does afford us quick acting physicians who KNOW that timing is everything with bowel transplant and that is why we chose them. So what must happen for us to go home? Fluid balance. Ashley's fluid status is in control of everything at this time. She has made great progress on her feeds and is off of TPN, but she is struggling to stay hydrated without the use of IV replacements. They are not willing to release her to our home as long as she is requiring IV replacements. Ashley's bowel is "leaking" or "spilling" albumin and potassium and other necessary elements. The walls remain weak after the rejection and even though her biopsy shows that the bowel is healing it will still take a while for it to become strong once again. We will need to be able to switch Ash from her IV fluid support to enteral support and pull her line before taking her home. This could happen as quickly as a couple of days or it may take weeks. No one knows. So what happened to Ash causing this episode of rejection? Their best guess is that she got a small viral infection due to her immunosuppression which triggered her high stool output and vomiting leading to less absorption of her FK medicine that then cause her immune system to flare up and attack her organs. They do not "expect" it to happen again. The farther out we can get from this episode without slipping back into rejection the better her chances. She is doing well overall and healing much quicker than expected. The entire team fully expected Ashley to lose sections of her graft, but she surprised them all and pulled out of it without requiring surgical intervention. We are very grateful for that. This has been a very difficult set back for Ash both physically and emotionally. It has also stolen away the progress she had made developmentally at home. Dave, Blake, Allie, and I look forward to getting her back to who she was and then encouraging her to do even more once we are home. After the blood infusion we took Ash to the Heartland of America park in downtown Omaha on the Missouri river. It is a beautiful park and it was nice to get out and take a walk and spend time talking with Trish. Ash was not feeling well so we headed back to the car and took her for a drive. We took some turns we haven't taken before and just drove to see where the roads went. As it began to get dark we found our way back to the familiar side of town, picked up some dinner and headed back to the hospital. I think the drive did Ash, and Trish, some good. Freedom is a wonderful thing when you have been in lock down and I know the girls enjoyed getting away for a few hours. Ash managed to remove her ostomy back and do some "finger painting" tonight. We have learned that if she gets to quiet it is usually because she is up to no good. She is now tucked away in her crib and sleeping peacefully. I do pray she make it comfortably through the night. She is now up to 60cc an hour on her tube feeds which is considered full feeds so we have turned her TPN off. Please be in prayer with us that we will not be needing the TPN again anytime soon. I feel if she can do without it for a few days then she can do without it for a long time. So as I fall asleep tonight I will pray that she won't need it anymore. Thank you for your continued prayers. We are about 1 1/2 hours into her 3 hour blood infusion and she is looking fabulous. After about the 30 min mark we could tell she began feeling much better. I am so glad to see her up and playing toys. Ashley had her bowel scope yesterday and the pathology results are not in yet, however Dr. A. said it looks as though it is continuing to heal nicely. Ash is looking pretty pale today. She doesn't have much energy at all. We are getting her ready to go downstairs to the treatment center and have her tank topped off. It is pretty amazing when I stop and think about it. Ashley is our little gherkin, but she carries so many people with her inside her tiny body. She has a liver, intestine and pancreas that were donated to her though the selfless act of a family who experienced great pain. She has received more blood, albumin, platelets and all manner of blood products from who knows how many different donors. It is amazing for me to just stop and think about how many people have given so that she can still be with us. Then when I sit back and think of all of you who daily take time to read about and pray for a Gherkin that most of you have never met all I can do is thank God for each of you. I truly believe without your presence Ash would not be here with us today. Thank you so much for loving our Pickle. We had a meeting with one of the transplant surgeons and a transplant coordinator. The meeting went better than we expected and we feel that we were able to convey our concerns to the team. I won't share the details yet, but I believe all in all the meeting went very positively for both sides and with the decisions made the end result will be a better quality of life for the Adams family. Have a great weekend, I am going to go hang out with my girls. I wake this morning feeling blessed. It doesn't take much to make feel this way. Its the simple things in my life that bring smiles to my heart. I'm not a showy, flowery, extravagant type of person. Plain, simple, classic, elegant. Thats my style(except when we are talking hair bows for my girls. I think we can all agree that bigger is always better!). When choosing a home for our family? Simple made me smile. No extra rooms. Just enough for our family and a big enough closet to convert into that nursery I just knew we would be adding some day. Decorating? Less is always more. Nice, neat, well loved items. Simplicity. Thats what I like. Cars? Don't need anything new. Don't care if its cool or fast or the "one everyone else is driving". Just make sure it is reliable, clean, and paid for. Its that simple. Yesterday the simple things that surrounded me brought the greatest joy to my heart. A knock on the door. It was Dave. Thats all it took, a simple knock. Chubby little hands applauding something only she knew was fabulous enough to warrant those applause. My heart was overwhelmed as I watched her exhibit her appreciation for what I do not know. Laughter from the backseat of my sister's car that was coming from two kids who seemed like the weight of the world had been lifted once they knew they were going to see their cousins for the holiday. I grew silent as I tried to identify the laughter and assign it to each face I knew was in the car. Standing back a few feet and watching Dave so proudly push his little girl in that stroller. He is the official driver whenever he comes to visit. Its such a simple thing to see, but it gives me such a feeling of happiness. Looking across the room to see two bodies, one large and one small, curled up on the little bed for a nap. Both of them snoring and content to be snuggled together. Conversation about nothing with my best friend. We could be visiting about dirt and I wouldn't care. I just love talking with him. He makes my heart happy. Her car seat. Each time I buckle her into it I have this sense of freedom. We are free to go outside, to take a walk, to come back as late as I would like. It is so simple, but to us it is a valuable gift that can not be taken for granted. Working a puzzle, playing scrabble, sharing a basket of fries, all things that will bring me much joy to reflect upon once he is gone again. Tucking Ashley Kate into bed underneath a quilt that I know each and every stitch of it came straight from my sister's heart. I love that she can rest underneath a blanket of love and prayers. Holding his hand as I drifted off to sleep last night, and then waking early enough to just listen to him breathe as he rested. So simple, but so appreciated. My life is blessed. Blessed beyond anything I could have ever dreamed, and blessed so much more than I deserve. Ashley will have a scope and biopsy this afternoon to check for recurring rejection. Her stool outputs remain too high and we would like to be careful and jump on it early if we need too. Her appointment went ok yesterday afternoon, and our meeting today is being rescheduled. We don't know what time just yet, but she has to have the scope done at 2:00. So much going on today that I really need to "simply" get on it. Its time to give morning meds and hang Ash's fluids for her scope. Thank you for your prayers. Thank you for your gifts. Camille, the package arrived and it blessed my heart! The slippers ARE wonderful. Thank you. Amy, I love each and every item. Thank you, and tell Kyle how much we loved his picture, his drawings, and the gifts. The ornament makes me smile each time I look at it and I can see his face and his big heart. Thank you. Linda, thank you for the package. The mustard seed and devotional book have brought me such encouragement on some really tough days. Your thoughtfulness blessed me more than you will ever know. I often find myself asking this question. I am really, really tired, but sleep does not come. I would like to say that Ash is sleeping on the bed behind me, but that is not really true. Her replacements ended about an hour ago and when the pump alarmed she did too. She has been awake rubbing her little eyes, scratching her head, and it looks to me like she is also wondering, "Why I am still awake." Dave will arrive in Omaha in about 6 more hours. I have thought a lot about his arrival tonight. I am so thankful he is going to be here with us for a few days, but at the same time knowing he is coming alone is difficult for me. I miss Blake and Al desperately and my heart hurts knowing that without God softening hearts, moving in mighty ways inside Ashley Kate's body, and basically giving us a Christmas miracle that I will not see them until they arrive here in Omaha for Christmas. Asking them to return here for another holiday seem so unfair to me. My heart was holding onto big, big plans for the holidays this year. Letting go of them has been a struggle. Dave and I will be working out the details of trying to hang onto our big Christmas surprise for Blake and Allie. We are going to see what parts of it we can still make happen and what parts of it we will have to let go of because I am not home to help complete it. We have a lot of planning and rearranging to do during this visit. I was really looking forward to celebrating Christmas for the first time with Ash in our home. I know some have encouraged me to "get over it", but its not that easy. God gave me this personality and a big part of me is tradition, family, memory making, and holidays. I lay awake almost every night thinking of ways to make it a more personal Christmas for the kids. Last year we basically gave the children new wallets with money inside of them because flying home with Christmas gifts was going to be too difficult. I really don't want to have to do that again. If we can still pull off their Christmas surprise then they will see it before coming to Omaha and will be able to enjoy it once they return. I think it will bless them and make their adolescent years very, very special. We'll just have to try to make it happen without mom. I had hoped for Ash's bowel to wake up, kick in, and perform its own little miracle today. It didn't happen. Today's appointment is not going to bring us the news we were hoping for. Her output has been very, very high the entire week and no moves have been made on her feeding pump or TPN pump since Sunday. Each day I receive a phone call from the dietitian asking if I have been able to stop Ash's TPN. Each day I say, "No, not yet." I fully expect them to make us take a few steps backwards today. I am trying to prepare myself for the disappointment that may come. This such a long, long journey. Restoration is hard to come by after rejection. That is what I am learning. So where is the blessing? I ask myself this question and it doesn't take long to answer it. Everywhere I look is my answer. Sure my heart is sad and lots and lots of tears fall from my eyes, but I laugh a lot too. I smile when I see Ashley Kate all sprawled out in the middle of the big bed forcing me to curl up on the small one. She is absolutely spoiled and I love that I get to do that. She just likes my bed more than her pack and play and the little bed is not big enough to safely lay out all of the tubing and pumps. This lands her little 2 year old body in the very middle of the big bed. Perhaps this is why I am having a hard time sleeping(I might add that the little pickle is now snoring behind me in MY bed). Her life is a blessing. We may be spending the holidays at the hospital for the third year in a row, but she is still with us and that is a blessing. I know many, many families who will be without their sweet children this holiday season and I am know that is far more difficult than what I am experiencing. I think of them so often. Her organs are a blessing. Without them we would be without her and I can't imagine the pain of not being able to even try. Our last year with her has been a blessing. We were given time and when you are faced with losing a child time becomes very, very precious. Making it out of the hospital and into this room is a blessing. It is peaceful and quiet. It is private. It is "ours" and it allows us to open its door to only those we choose. When staying in a hospital you have NO choice as to who or how many come through that door and what times of the day or night. When our door opens we now know that it opens to kind, friendly faces who have chosen to come visit. What a blessed feeling that is. In just a few more hours we will get to open that door to Dave and I am getting really, really excited about that! That is a blessing! Although it as been a tough couple of weeks God has still been so very good to our little family. He continues to give us strength on the days when we have none. He continues to comfort and heal our hearts when they have been injured or disappointed. He continues to provide friends and their support to us in the very moments that we need them most. He is good. He loves us so very much, and He is working in Ashley's life and mine. He is God and He is near. Its been another night of up and down running replacements and emptying ostomy bags. Ashley Kate decided to remove her own central line dressing and so she required a new dressing. It is definitely a two person job, but somehow I managed to clean and dress the site while wrestling the very skilled arms of a two year old princess. This morning I am coming to you to ask for specific prayers over the next three days. There are several things that we need to have covered as we approach our clinic appointment and our meeting with the surgeon on Friday. First and foremost in my mind after emptying Ash's ostomy this morning is her absorption. On Sunday evening I was able to make a change in her feeedings. She went up to 50cc of formula and down to 10cc of TPN. That meant we are only one change away from full feedings and NO TPN. I had really hoped to be able to make that change before attending our clinic appointment tomorrow. Unfortunately, I don't see it happening. Ashley's ostomy output has increased and she is requiring a great amount of replacement fluids to be run through her IV. This tells me her bowel is not adjusting well and is not absorbing the formula. Not good. We need for her to tolerate full feedings in order to get her home. Please pray that her output would slow down and that we would be able to make that final increase soon. Secondly, our first outpatient clinic appointment will be tomorrow at 2pm. I am hoping for good things to happen. This will be a key appointment that decides where they want to go and what they want to do with Ashley Kate. Thankfully David will arrive in time to attend along with us. Next is travel. Dave and the kids will be traveling for many hours tomorrow. Dave is flying in to Omaha to spend the next four days with us, and our children will be on the road tomorrow evening traveling for the first half of the drive with Nan and the second half with my sister. Please pray for their safety. They are two of the most precious things in my life and knowing they are on the road for so many hours is difficult for me. I also pray they have a wonderful visit with our families and that joy and laughter will replace any sadness they may feel during the holiday. Our finances. This stay in the Lied is a stretch for our monthly budget. The sooner we can get home, the quicker the strain and burden can be lifted. Dave is working longer and longer hours attempting to see more and more patients during this time. He is exhausted and my heart aches knowing the stress he must be feeling. It is no secret to those who have a medically fragile child how draining their care can be on a family's budget. Dave is insisting on returning to Omaha again next week to spend the holiday with Ash and I. I am trying to convince him it is not necessary. Nothing special happens around this place on holidays and the expense of travel is very high during this season. Your prayers would be appreciated. God has never failed to meet our needs and He blesses us greatly. I know He saw this one coming even though we did not. Finally, our appointment with a surgeon will be on Friday at 2p.m. Please cover us in prayer while we sit down face to face and talk about Ashley's future. Dave and I need to have our questions laid out, be able to communicate effectively without getting too emotional, and have willing and open hearts to hear what the "team" would like to have happen. Our goal is to share with them how we feel about living Ashley Kate's life making it full of quality. We don't believe we are doing that at this time while she and I are separated from our home, our family, our community, and our support system. The things that I am doing for Ash can be done in our home just as safely and much more effectively with the support of my friends and family. A well rested mommy is a better mommy. A well supported mommy is a better mommy. A more relaxed Ashley is a healthier Ashley. A happier Ashley is a healthier Ashley. Our desire is for our family to be reunited and there is nothing "magical" taking place in this room in Omaha, NE that can't be done in Texas. We are so willing to return every two weeks for a clinic schedule and to do any testing and lab work on whatever schedule they would like. Dave and are good, loving, responsible parents who want the best life possible for Ashley Kate so my prayer is that our surgeon will see that and that we will all come to the best decisions for our daughter. I don't know why I'm here. Just lonely I guess. So many thoughts running through my head. Ashley Kate is sleeping and I sit waiting to begin her replacement fluids. I will be running them until around 3a.m. The alarm will go off every hour and ten minutes telling me to replace the syringe so sleeping is kind of useless until I have finished the last one and have flushed her line. So I sit and wait and think and pray. The lights are all off and only the screen illuminates the room. The Christmas music is playing lightly in order to fill our room with the peace that it brings. It makes me cry. Not only because of the beautiful sounds that I hear, but also because of where we are this holiday season. My morning devotional has been rehearsed in my mind all throughout the day. It was called, "But God". It began by telling the story of a young preacher named Vincent. A young man with a vision to build a church. He ministered, tended to the injured, fed the hungry and his congregation grew. Only there was a problem. His superiors didn't like the way he looked, the way he dressed, the place that he lived, or the fact that he gave his salary away to the needy of his congregation. Eventually they dismissed him. Hurt, angry and confused by what had taken place he questioned. His only desire was to serve God and build a church to serve Him so why hadn't God allowed it to happen? One day as he struggled with these questions he watched an old man as he struggled under a load of coal and he began to draw a sketch of him. At the time he didn't realize his true calling. This young man eventually became an artist known throughout the world. His name was Vincent Van Gogh. God had not called him to lead a church. He had called him to be an artist. I keep asking myself, "Was there anything wrong with Vincent's desire to lead a church?" No. I don't believe there was, but just think about what the world would have missed had he not followed the true calling of God in his life. As I think about this story I ask myself, "Is there anything wrong with my desire for Ashely Kate to live a "normal" life. Free from hospital stays, medications, surgeries and the like? Is there anything wrong with the dreams I hide in my heart for her? The dream of someday having a chubby toddler running around our Christmas tree who answers to the name of Ashley Kate? No. I don't believe there is, but oh, what would I have missed out on if she had just been that "normal" child of my dreams. Hurt, angry and confused I still seek His true calling for our sweet baby knowing that it has to be so much larger than what I could have ever dreamed. The tears come and they don't stop as I realize more and more each day that she may never understand the world around her like we all do. Yesterday I shared with my sister that I don't think Ash will ever comprehend what Christmas is. I fear that her mind will not understand that it is a special day and not just another day. As I cried over the death of my dreams for this beautiful child my sister shared her thoughts about it. "Trish, but wouldn't it be wonderful for her if every day was just as magical as Christmas day? If her mind only ever found joy and happiness in each day and if she never had to understand the ugliness that is in the world around her?" I realized that she was right. It wouldn't be a bad thing if my Ashley never understood disappointment, hurt feelings, broken dreams. If she only ever smiled and played and hugged her daddy and patted her mommy. That would be just as beautiful. Just as magical. If that is what He has in store for our tiny miracle then why would I ever say, "But God, I wanted this for her or I dreamed that for her." Surely His calling for her life will be so much more than I could ever comprehend. Dave was so right today as he said to me, "This one has been hard on her." Yes, it has. She has lost so much of what she had gained, but I know in my heart underneath the sadness, the pain, and the loss that her Father is here and He is working. She lays behind me on the bed sleeping. Making sweet sounds as she breathes in and out. Her lashes are long, her cheeks still rosy although they are swollen and puffy, her little arms tucked behind her head, and she dreams. She doesn't dream of sugar plums, but maybe she dreams of her home. Maybe when she closes her eyes she can see her daddy, or her nursery, or Blake and Allie. Those are things she does recognize, and tonight I think I would say that is even better than Christmas trees, or twinkling lights, or stockings hung on our mantle. I would rather her comprehend family and what it feels like to be loved with out conditions. I can't say, "But God, I wanted this or that for her. I will say, "Yet God, You gave us a miracle in this child and for that I will forever be grateful." Ash is doing a bit better today. She spiked a low grade fever Friday evening and it finally broke this afternoon. Trish called to get an order so she could draw a blood culture from her line yesterday morning and dropped it off at the lab. No news is good news. Her feeds have been increased to 50cc an hour and her TPN is only running at 10cc. One more increase and it will be turned off. We have no idea how long it will take to get her to that increase. It may only take a few days or it could take weeks. Her labs show that her albumin is low and Trish said she is showing some all over swelling. They have decided to have Trish run 25% albumin twice a day to try and get Ash to transfer the fluid back to the right spaces. Her bruising is getting better and she seems to be tolerating her line a little better. She is currently sitting up and playing toys for the first time in a few days. I sure do love getting good news from Omaha. Overall I think they are doing well. It looks like Trish will not be home for the kids Thanksgiving break. She missed the carpool goal. 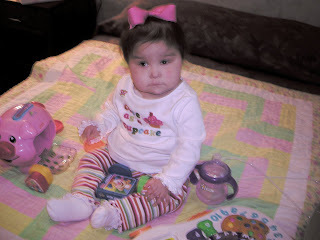 I will be traveling to Omaha on Thursday in order to be present for a meeting with one of Ashley's transplant surgeons. We are considering allowing the kids to go to visit our family in Oklahoma for the Thanksgiving holiday. They would have a much better time than eating frozen burritos in the cafeteria. We just wanted to give an update and thank you for your continued prayers. Edited: Please, please don't feel the need to apologize to me. You have become treasured "friends" in my life and I do not write to make you doubt your words of encouragement. I truly believe those who hurt and stung with their comments did so knowingly. They know who they are (most of them hiding behind anonymous), and this post was not written to elicit apologies from them either. I just wanted to share with you where I was and why I have not been present. You are loved. With trembling hands and a an unsure heart I have decided to give journaling a try this morning. What an emotional week it has been. I realize I don't have to tell you that. I'm sure you have sensed how difficult it has been. A few weeks ago a stranger(although she is no longer) picked up the phone and said, "Trish, My name is ________. I live here in Omaha and I am at the store right now and I want to know what things you need. This is what I have picked up so far and now I want to know if you need, kleenex? Ok. Do you need q-tips? Ok. How about laundry soap? Chapstick? Ok. Here are the magazines. What type do you like to read? Do you need any quarters for laundry? Oh, I know you need diet cokes. How about bottled water? Our conversation continued as she refused to take no thank you, you don't need to do this for an answer. I finally relented and allowed her to bless me. A couple of hours later she knocked on my door and came in toting all of the "necessary" items I truly did need. As she introduced herself we sat and chatted. Eventually she said something like, "I feel like I know everything about you and you don't even know me. Its kinds of weird and a little unfair." I just laughed and didn't really think too much about that statement. Over the course of our stay she has "popped" in bringing diet cokes and magazines. Cheerios and laundry soap. A friendly smile. Encouragement and support. I have thought an awful lot about her statement this last week. I am trying to place myself in "your" shoes. Not the MAJORITY of our readers, prayer partners, and supporters, but the few who come across in their words with this feeling of "entitlement". This attitude that they know me well enough to strike with words, thoughts, opinions, and statements with no regard to the pain that may be inflicted. Often I come away from our journal stunned. Shocked. Injured. I leave shaking my head and with tears stinging my eyes as I wonder what in the world have I done to "them" to deserve that? I think to myself, "They don't even know me. They don't know my heart. My intentions. My hopes. My struggles. How can they say that to me or about me? I think I now know. They think they do know me. They must feel entitled by the glimpses into my life that I have allowed them to have. They truly feel they have the right to enlighten me on how I should be living, coping, praying, feeling, or raising my children. Is there anything wrong with that? I don't know. This is where I am struggling. I have opened PARTS, GLIMPSES, PIECES of my self to the readers of this journal. So now I am taking time away. Time to work on "guarding my heart". Just like His word instructed me to. My heart has been left open, not guarded in any way over the course of Ashley Kate's life. Why? Because I DO NOT feel entitled. I KNOW I have been blessed in this life. I KNOW she is a gift that has been given to Dave and myself. I KNOW that she may be with us for a short time and I do not want to take her or any moment of her life for granted. I AM SO BLESSED, and I KNOW it. This knowledge has encouraged me to share what God has given to us. Ashley Kate is amazing. She is precious, and fragile, and tiny, and beautiful, and strong, and something I was not entitled to. How can I keep her to myself? God is working in her life. I don't understand the ways He has chosen to use her. I could easily share with you how badly I wish she had been given a healthy body, but this is not how He has chosen to use her life. He is using her struggles to bring glory to Him and because of this knowledge I have chosen to share her with you. Forgiveness has not been the issue. I forgive easily because I have been forgiven much in this life. Figuring out how to guard my heart with grace and to what extent I share our family with the world is the issue. There may be times when comments trigger these times of soul searching to be done inside of myself. Just know that even while I am absent I am loving and appreciating the many, many people who pray for our Ashley. I could never express to you what YOUR presence has really meant to me. Ashley and I are now outpatient status. I say that with much trepidation. I do not know if it will last long. She is very uncomfortable because of what has been placed into her little body. It was a communication error. It is not what we or our team of doctors expected her to return from the OR with. What do we do with it now? We are all a little unsure. She continues to swell and breathe uneasy from the pain. At what point do we decide it has to be removed? Before I left the hospital last night I repeatedly asked, "Is she safe?" The answer, "We think she is safe. She is just uncomfortable, but pulling it out now would be to rough on her." Ashely's jugular vein is bulging from the size of the catheter in it. She is swollen and bruised and to quote what our surgeon said yesterday, "They really tore her up down there." Your prayers for quick resolution would be greatly appreciated. She needs to be off of TPN, on full feeds, and not stooling out and requiring IV replacements for it to be pulled. We are getting closer, but that 20ccs is still a long ways away when you are dealing with a transplanted, injured bowel. Just know that I am very aware that we may be returning to an inpatient status quickly. I pray we don't have to, but as always I WILL do what is best for our baby. Remember that pretty purple central line Ash got on Monday. Well, there seems to be a problem. Ashley's head has been swelling and getting larger since the line was placed. It has been decided that the wrong one was put in and it is to large for her. It is believed that it may have caused a blood clot in her jugular vein thereby decreasing the venous drainage from her head. What a pickle our little Gherkin has found herself in. The good news is that the Drs. don't "think" it will be a problem and they once again have released Trish and Ash from the hospital. They have not moved yet, but should be moving into the Leid (a hotel attached to the hospital) later this evening. I know it will be a big relief for Trish to get some peace and quiet in her own room. Ash's day has been a bit better as the FK level is slowly working its way down. Thank you so much for your continued prayers for my girls. Last night the news was that Trish and Ash were not going to be getting out so long as Ash had a central line. We are not really sure why because Ash had a central line in our home for over a year and we are perfectly capable of caring for it. However, that was the word. This morning during rounds the Dr. told Trish to pack her things because she was going outpatient today. What? Where did that come front. Trish was just standing there in shock with her mouth hanging open. She didn't argue, she just started packing. She quickly realized that we don't have a stroller in Omaha so she found someone to sit with Ash while she ran to Target to find a stroller. Just a few short hours later she was now told that she would not be going outpatient today. Ash's face is swelling and they are concerned that she may have a blood clot in her jugular vein from Monday's surgeries. Additionally Ash's FK (anti-rejection med) level came back at a 37. Normal for Ash is 5, 37 is FK toxicity. She is not a happy little Gherkin today. She is so irritable and feeling absolutely miserable. So it was decided that now is not the right time to go outpatient. I can't even begin to imagine the emotional roller coaster Trish has been on today. Please pray for Ash tonight as the FK toxicity is making her absolutely miserable. Most of her hair has fallen out and I think Trish's may as well because she can find no way to console Ash during this time. Please pray for Trish as well as she has had a very challenging day and I think it will stay that way until Ash's FK level comes down. The girls made it back to their room around 4:00. I just spoke with Trish and she and Ash are very tired and already going to bed. They didn't sleep much last night. The surgeries both went well and Ash came out sporting a shiny new purple central line. I just can't wait to see it. It sounds kinda girly. Allie is very excited about it because that is her favorite color. They are already feeding her at 10cc and hour. They placed a tube 30cm long into the jejunal portion of Ashley's bowel. We are hoping this will stop the vomiting and allow us to advance feeds enough to get her home. Trish says Ash looks good. Thank you for all of your prayers. Allie had to choose a state to learn about this year. She wrote a letter to the Hawaii visitor and convention bureau and today she brought home her response. There are several pamphlets and lots of information. When Allie spoke to Trish on the phone tonight she informed us that when Ashley gets home we need to celebrate by going to Hawaii. I certainly do agree with her, I just think she is going to have to get a job so she can help get us there. Funny, last year she was wanting us to take her to Canada. One thing that is easy to overlook in Ash is her age. She has been so little (Gherkin) for so long that it has been easy for us to overlook. She looks and has the abilities of a 6-9 month old infant so we often forget. However last night she reminded us that she is as every bit a 2 year old as any of the others. Last night while making trouble she managed to remove her central line. That means she first had to remove the dressing, then get a hold of the thing and pull hard enough to rip out the stitches that hold it in place. I don't know how something so painful can be fun, but it must be for her. So today in addition to getting the new G-J (feeding tube into the intestine) tube placed she will also be requiring a new central line. I suppose I can see 2 blessings in this. First she would not have been able to go outpatient with the type of central line she had. We have requested that they put the other type in so she can go outpatient when the time comes. And second, I can see that she still has a lot of fight in her. Yesterday the team did not want to put in the broviac type of central line, the one she could go outpatient with. Because she had to have one anyway, Trish said she would not sign consent until they could agree to use the type that would allow her to go outpatient. Way to go Trish, I am so proud of you. She just now went back for both, count them, 2 surgeries. I will update when I hear how it went. Throughout Ashley’s life we have often found ourselves stuck between a rock and a hard place. We have had to make more gut wrenching decisions in the last two years than I ever imagined I would make in a lifetime. I can see that my wife is alone in a small little room 700 miles away having to make yet another decision. This time concerning the future of the public side of Ashley’s Story. I support the decision she made to step away from the Blog, however, I don’t feel we can stop Ashley’s Story. Trish doesn’t have a selfish bone in her body, but I do. I am selfish because I don’t want to lose even one of your prayers for our Gherkin. I believe with everything in me that God has spared my daughters life on more than one occasion because of your prayers. Because I am selfish, I am not willing to give that up. I will continue to write Ashley’s Story while Trish takes some time off. It won’t be as well written and it probably won’t be as enjoyable to read as Trish has many talents that I don’t have, but I will do whatever I can to keep you informed because I know a little pickle who needs your prayers and support. Ashley will be in surgery tomorrow morning at 10:30. She is no longer on any amount of feedings. Her bowel could not tolerate them yet. We will be starting over, again. A sixth attempt at placing a G-J tube will be made with the hope that it might work for her. If you still feel led to pray we would greatly appreciate it. Thank you for your understanding and I especially thank you for your prayers for Ashley. Thank you to those who came to encourage, lift up, and carry a part of the burden. I love you all deeply. I was always honest. On the good days and the bad. Never intending to cause such conflict and strife , or to add pain to our hearts. We love the only way we know how. We parent the only way we know how. We live the only way we know how. Ashley's story will be silent for a while. I have no idea how long, but for a while. I will continue to write it, but I won't be publishing it for now. Your presence was NEVER taken for granted. I will always be grateful for your prayers for our family. Please don't take it personal, but some days are tough enough without all the extra "opinions" that are given. Your kind words will not be forgotten. At the end of the day I will answer to the Father, to my husband, and to my children for the way I have chosen to live. To be honest, I don't care to please the whole world. If I might ask one prayer request, Please pray for Ashley's vomiting. It only gets worse and is causing us much concern. Today we were told it could continue for months. How frightening that was to hear. Thank you again for your faithful prayers.